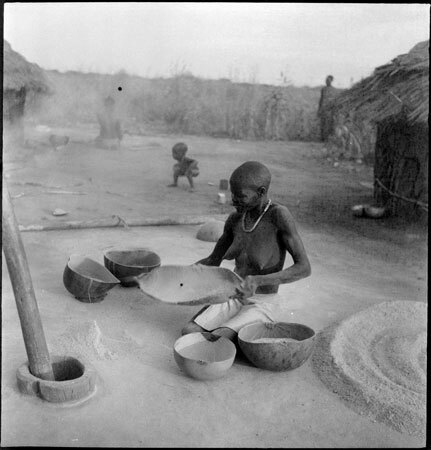 An Anuak woman winnowing grain in a homestead. Next to her is a sunken mortar with long pestle within it as well as gourd vessels and pounded flour spread out. Morton, Chris. "Anuak woman winnowing" Southern Sudan Project (in development). 03 Jan. 2006. Pitt Rivers Museum. <http://southernsudan.prm.ox.ac.uk/details/2005.51.108/>.